The 2019 newsletter gives details of the 2019 Applications Olympiad. The Computer Applications Olympiad tests technical ability with documents, spreadsheets and databases, as taught in the school subject CAT (Computer Applications Technology). The final four-hour round of the Olympiad required finalists to be creative with data by anticipating problems, spotting trends and imagining possible solutions. A massive data set was used – hundreds of thousands of anonymised records from a decade of the Cape Town Cycle Tour. The high school finalists not only analysed the data, they also responded to a trend it revealed about youth entries. They had to illustrate the trend in an informative graphic that would visually promote the benefits of participation in this cycling event to teenagers. The problems were set to show that managing Big Data is a key skill that will offer employment opportunities. The national finals were held at Bergvliet High in Cape Town during the winter school holidays. Twelve learners out of 5 226 participants from the qualifying rounds took part. Medals were awarded to the top six. 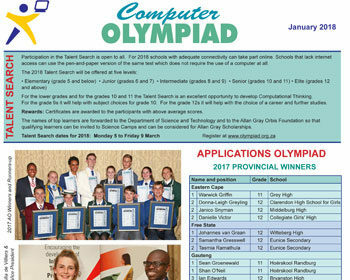 Sean Groenewald of Hoërskool Randburg claimed gold in the 2018 Computer Applications Olympiad. He is in grade 12 and loves computer challenges – he was also a finalist in the Programming Olympiad in 2017. He plans to study Mathematics and Computer Science at the University of Cape Town and says he wants to work for Google. As the gold medalist he is eligible for a first year scholarship to study at the University of Cape Town in 2019. Two silver medals were awarded. One to Shan O’Neil, also of Hoërskool Randburg. He plans to study Computer Science at UNSW in Sydney. 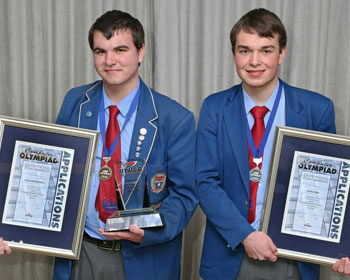 The other silver medal went to Daniel Olivier from Paul Roos Gymnasium in Stellenbosch who plans to study Computer Science at the University of Stellenbosch. Both of Gauteng’s two bronze medal winners, Christopher Dovale, headboy at Boksburg High, and Heather Wimberley of Brescia House (Bryanston), are interested to study mechanical engineering and robotics. Heather, presently in grade 11, has her sights set on studying at MIT. The third bronze medal winner, Dylan Nel of The Hill College in Mill Park, Port Elizabeth, plans to study digital arts, programming and game design. Will AI cost teaching jobs? The main speakers at the Awards Dinner in Cape Town were the Western Cape MEC for Education, Debbie Schäfer, and entrepreneur Bryan Banfield, founder and CEO of Artibeus IT. Banfield said that the skills that had brought learners to the national finals would give them wide choices in a rapidly developing digital economy. He challenged them to look at opportunities in the world around them ‘with fresh eyes’ and to bring their own solutions to industry. He asserted that some jobs would be lost through the impact of technology. He suggested that when Artificial Intelligence (AI) is applied in classrooms, teaching jobs could be affected. Minister Schäfer vigorously countered Banfield’s assertion that teachers would be made redundant by technology. Teaching roles would change with technology, she said, and training would be given, but the teachers’ duty of care and role in guiding learning would always remain. Minister Schäfer congratulated the 12 finalists on their exceptional performance as the top participants from over 5 000 nationally. In relation to the subject CAT, she was “pleased to see that in March this year, the Department of Higher Education and Training (DHET) issued a notice in the Government Gazette revoking the designated subjects list for the Senior Certificate and National Senior Certificate which will open the way for many more learners to develop literacies such as programming and coding for future study and work”. She added that “Computer Applications Technology (CAT) plays an important role in providing a foundation for further study in critical subjects such as programming and coding”. In conclusion Minister Schäfer thanked the members of the Scientific Committee, all of them former teachers, “not only did you volunteer your time to procure the data, for setting the questions and developing the solutions for the tests, but… you also published the Solutions Guides for all participating schools. These guides are valuable for teachers who use them to show their learners a variety of ways to answer challenging problems”. The encouragement to enter the Olympiad came from teachers. Finalist Andy Makaepea of St Enda’s Secondary in central Johannesburg said he entered ‘to test my skills against some quality competition’. Jenny Cole, a professional trainer from Durban who attended the awards dinner, remarked ‘The main theme of the evening was …my teacher said I should’. 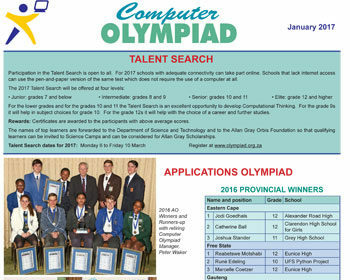 The Computer Applications Olympiad is a project of the Institute of Information Technology Professionals of South Africa (IITPSA). Ulandi Exner, national President of the IITPSA handed over student membership certificates to the finalists. She said that as the anchor sponsor of the Olympiad, the Institute aims to increase the number of young people entering IT professions in the country and to support them to grow throughout their careers. 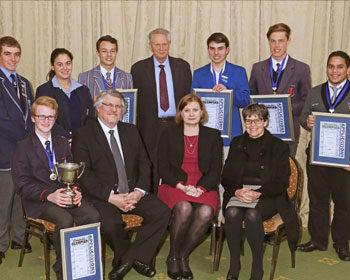 Dylan Nel of The Hill College in Mill Park, Port Elizabeth, earned a first place provincial certificate for the Eastern Cape in the second round of the Applications Olympiad, and at the final he earned a bronze medal. Dylan is a veteran of mathematics and programming Olympiads. He said he found the Applications Olympiad ‘well-structured, thought-provoking and a lot of fun, an all-round good experience’. He plans to study digital arts, programming and game design, and follow his interest in motorbike mechanics. Silver medal winner, Daniel Olivier is in grade 12 at Paul Roos Gymnasium in Stellenbosch where he is on the debating committee, runs an e-sports gaming club and is part of the school newspaper technical team. Daniel plans to study Computer Science at the University of Stellenbosch. Two other finalists were also from Cape Town, Huw Irlam of Pinelands High (3rd in the Western Cape) and Caitlin Spolander of Rhenish Girls’ High. 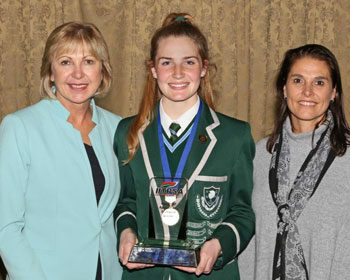 The gold medal winner of 2017, Mia de Villiers of Paarl Girls’ High also qualified for the finals but was in London at the time of the contest. Finalist Liam Pillay is a grade 12 achiever from York High were he has full colours for academics and service. He intends to study to become a 3-D Animator to make movies or games. High resolution photographs of the awards function, guests and finalists are available on request from info@olympiad.org.za or by calling landline 021 448 7864. The 2018 newsletter gives details of the 2018 Applications Olympiad. 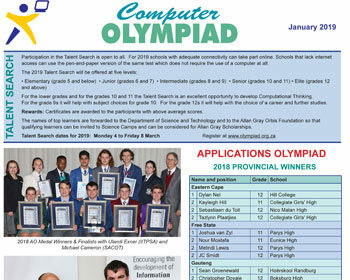 On the day the storm closed Western Cape schools, one Paarl teacher made a plan to let her top three learners take part in the qualifying round of a national computer Applications Olympiad. For an hour on the unexpected ‘day off’, Marlene Dreyer supervised as her learners tackled 25 tough tasks using Word, Excel, Access, and the internet. This effort got Mia into the national Applications Olympiad Finals four weeks later. Competing against 12 other finalists, Mia proceeded to win the gold medal. She described the day-long test as ‘challenging’ and the Olympiad as ‘an overall good experience’. Mia is in Grade 11 at Paarl Girls’ High School and plans to study Actuarial Science. She has provincial colours for mountain biking and might spend her prize money on cycling equipment or save it. Heather Wimberley (Gr 10) from Brescia House in Sandton won silver and had ‘fun learning new skills’. She is also an outdoors person and a member of the Orienteering National Youth Squad. The other Silver medalist, and also from Gauteng, was Shan O’Neil (Gr 11) of Hoërskool Randburg. He said it was ‘a very fun test’ but wished he ‘had 2 more hours’. Like gold winner, Mia, he is also takes both computer subjects, CAT and IT (Information Technology). He wishes to ‘become a professional programmer’ and ‘study overseas’. ‘The girls did so well’ was the delighted comment from Moira de Roche of the Institute of IT Professionals (IITPSA), the sponsor of this Applications Olympiad. Three of the six medal winners were from Girls’ Schools. 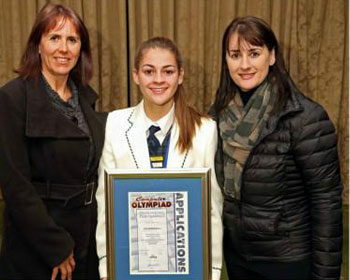 Danielle Victor (Gr 10) from Collegiate Girls’ High in Port Elizabeth won bronze, and has an interest in studying Pharmacy. The IITPSA offers a full bursary to attract particularly female learners to study at tertiary level in the ICT field. 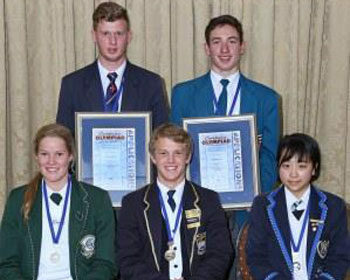 Johannes van Graan, Head Boy at Hoërskool Witteberg, won a bronze medal. ‘Although it was really difficult… I learned a lot from the Olympiad’. Johannes plays 1st team rugby, participates in Mathematics, Science and World Knowledge Olympiads, and plans to study Mechanical Engineering at the University of Pretoria. Milan Smedley (Gr 12) from Paul Roos Gymnasium in Stellenbosch earned a bronze medal from the ‘unique experience’ of the Applications Olympiad. In line with his favourite subject being History, he only ‘listens to music from 1940 – 1990’ and may ‘make certain exceptions for good recent songs’. Milan plans to study to become a film director. The key person for the Olympiad is an enthusiastic CAT teacher. The teacher’s role is to organise the learners and venue, and to download the data files. For online entries where broadband is adequate, learners take part online and their answers are marked by the computer and their results sent back to the school. There were 4 631 participants for whom results were received this year. The Olympiad office printed and posted 2 350 certificates to schools for the top 50% of the participants. 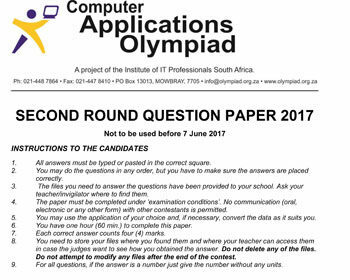 2017 Computer Applications Olympiad sees the introduction of a Second Round. The Olympiad is for CAT learners, ICDL candidates and others who are computer literate. Being able to use computer applications is fast becoming essential for study and work. Applications help learners to make sense of data and to strengthen insight. 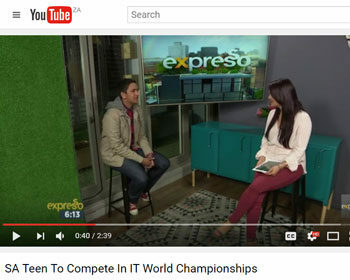 The Computer Applications Olympiad encourages learners to see the bigger picture where: Data à Information à Knowledge à Insight. This is why the SA Computer Olympiad has made Round 1 of the Applications Olympiad more accessible and interesting around the theme of popular music. The one-hour Olympiad runs at participating schools from 8 to 12 May at any convenient time. It costs nothing to enter. The questions test learners’ skills to make sense of data in different formats: word processing, spreadsheets, databases and presentations. The Applications Olympiad is for learners who have a working knowledge of these common applications, including those who take CAT or IT at school. The Solutions Booklet with its detailed explanations is popular with teachers. It is emailed to schools immediately after the contest. The offline marking remains quick and simple; one word or one number answers – either right or wrong. Where learners write the contest online, there is no marking at all for the teacher. Bronze, silver and gold certificates are awarded to the top 50% of learners across the country. Those learners who qualify for the new Round 2 (on 7 June) will stand a chance to earn Provincial Certificates and to be invited to the Finals in July where medals and cash prizes will be awarded to the winners and to their schools. While Round 1 is easier than in the past, Round 2 has more higher-order questions. Round 2 also has fewer word processing questions and more spreadsheet and database questions. It also has a couple of web design questions. Clarendon High School Matric pupil Catherine Ball hit the front page in East London. The six winners of the 2014 Applications Olympiad represent five provinces. And the winner came from Beaufort West.